The body fat reduction effect of the traditional Korean fermented soybean product, gochujang, has earned global praise. CJ CheilJedang announced that its article, which proved the body fat reduction effect of gochujang, has been published in the ‘Journal of Food Science & Technology,’ an international journal in the field of food science and nutritional science. This journal is a prestigious international journal that publishes the latest research findings in all fields of food and nutritional science, and it ultimately approved publication of this article that proved the body fat reduction effect of gochujang developed using CJ’s own strain through animal testing. 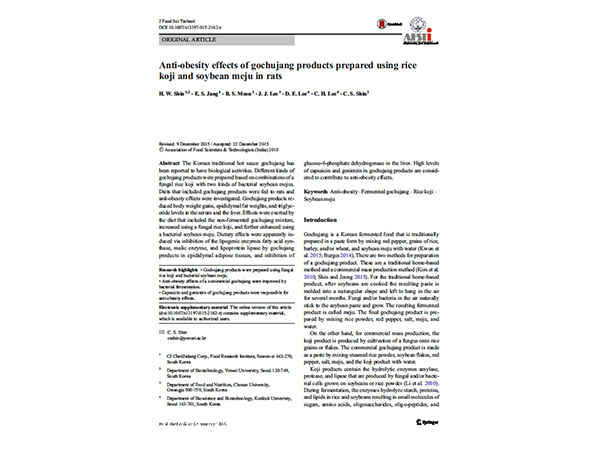 The body fat reduction effect of gochujang has been constantly studied in related industries and organizations, but the articles were mostly concerning the ingredients of gochujang such as hot pepper or capsaicin, or specific components of hot pepper, while very few studies on the effect of gochujang itself were actually published in an international journal in the form of an official research article. Thus, the publication of this article will work to provide global publicity to the excellent functions of Korean fermented soybean products based on scientific grounds. the experimental group on a high-fat diet without gochujang. The blood neutral lipid and cholesterol levels also decreased, accumulation of fat in the liver was suppressed, and the size of fat cells decreased as well. The study also discovered that the fermentation process of gochujang itself helps reduce body fat. Compared to non-fermented gochujang that merely mixed the ingredients such as hot pepper and rice, gochujang that was fermented with a self-developed strain showed a greater body fat reduction effect. This proved that aside from capsaicin’s effect in hot pepper, the fermentation substance created by the effect of the strain also has a correlation with anti-obesity effects.